Chrysler There are 21 products. Convertible hydraulics rebuild & upgrade service (using best seals available) for Chrysler Crossfire Cabriolets and Chrysler PT Cruiser. 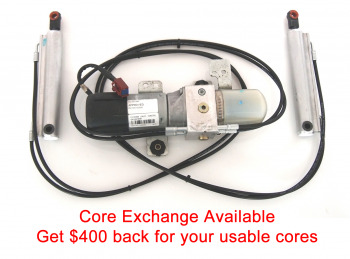 Chrysler Crossfire Convertible Model Years 2003-2007 use six hydraulic top cylinders. There are two locking cylinders, two for the bow tension (moving the rear window up and down), and two main lift cylinders. Unfortunately, the seal material used in the OEM cylinders is particularly prone to chemical decay in warm climates, and we highly recommend to upgrade all cylinders at the same time. At the very least, cylinders should be upgraded in pairs. On the bow tension and main lift cylinders, Top Hydraulics actually replaces a total of six seals. Top Hydraulics' proprietary seals are far superior to the original seals used both in choice of material and in their geometry. This makes your used cylinders actually better than new ones, with a much increased service life. You send in the cylinders that you want to have upgraded, and Top Hydraulics will turn them around within 1-3 days. Chrysler PT Cruiser Convertible Model Years 2006-2008 use two hydraulic lift cylinders. 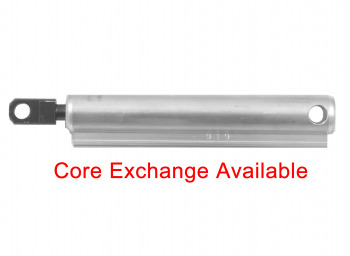 Top Hydraulics offers a Core Exchange option for PT Cruiser hydraulic cylinders, where we can ship cylinders from our stock first. Chrysler | 2004-2008 PT Cruiser ConvertibleRebuild/Upgrade service for main lift cylinder(s) using Top Hydraulics' proprietary seal upgrade, or replacement of hydraulic lines, or rebuild service of the pump, or any combination of the above.If your convertible top is moving slowly or not at all, you likely have one or both of the hydraulic cylinders leaking, which emptied out the pump's reservoir. This is normal for a convertible of this age, as the seals in the hydraulic cylinders are decaying. The seals typically decay first on the bottom of the cylinders, where you would least expect it. 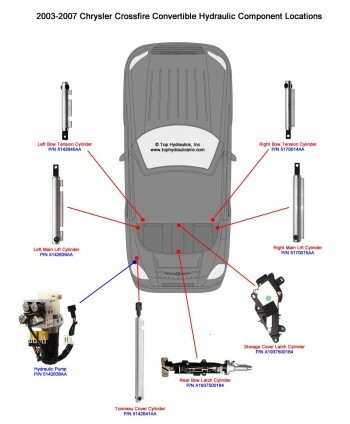 Top Hydraulics replaces and upgrades all seven seals per cylinder, with an expected service life of several decades!The PT Cruiser convertible has two lift cylinders for the convertible top. Top Hydraulics' seal material is far superior to the OEM's. Please send in your cylinders to be rebuilt, or use our core exchange service, also known as up-front shipping. Optional up-front shipping is more expensive, but very convenient. 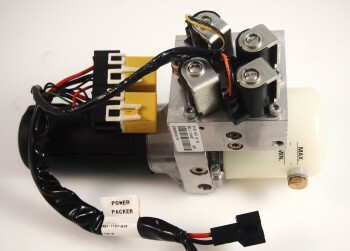 It includes a $150 core deposit plus a $40 surcharge per cylinder.When removing the hydraulic lines from the cylinders, please retract the cylinder shafts first. That way, you avoid that any accidentally slipping tool might damage the polished cylinder shaft. Top Hydraulics can replace the shafts with some from our own production, but we would have to charge extra.These cylinders typically fail first in the rear (bottom) of the cylinder. 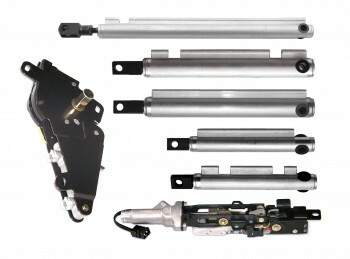 The OEM (Original Equipment Manufacturer) cylinders have front and rear caps that are sealed from the cylinder bodies with a seal material that decays over time. Top Hydraulics replaces those seals with a far superior material that is not sensitive to water and is resistant to most additives in hydraulic fluid. Our seals have a larger cross section for a superior static seal. 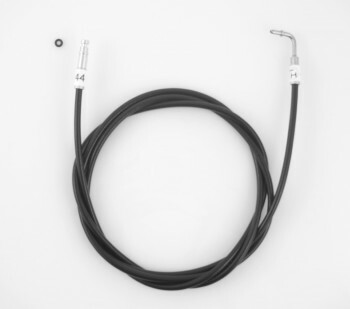 The OEM cylinders rely on a tiny o-ring to energize a very thin, flat rod seal. The o-rings loose elasticity over time, and the OEM rod seals wear out. Top Hydraulics manufactures and installs its own precision CNC machined front caps in these cylinders, so that the tiny OEM rod seals can be replaced with Top Hydraulics' own u-cup seals for a far more reliable seal and much longer service life. 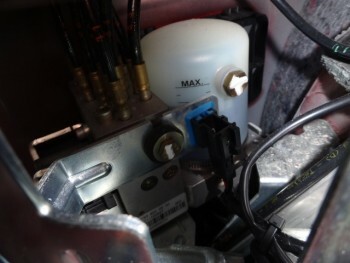 In addition, the size and geometry of Top Hydraulics' u-cups is forgiving to tiny scratches and imperfections in the cylinder rods (aka piston rods or shafts), caused during the original manufacture, during removal from the car, during installation into the car, or by impurities in the hydraulic fluid. 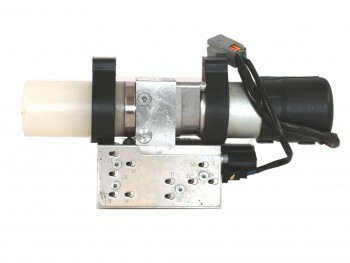 Top Hydraulics replaces the port seals (where the hydraulic hoses attach) and ships spares with each cylinder, in case your mechanic accidentally pinches an o-ring while installing the hydraulic hose.Note: if you have Top Hydraulics rebuild only one cylinder, or both, but not the full system, then you will have to refill the hydraulic pump with fluid. The system is self venting, and the air from the cylinder(s) will eventually end up in the reservoir. It can take several cycles to get all air out of the system. Keep topping off the reservoir until the fluid level does not drop below the fill mark any more. You can fill the pump slowly with a syringe or a squirt bottle through the fill plug in the middle, on top of the pump. You may need to use pliers or vise grips to loosen the plug if you end up stripping the 5-mm inside hex. The filling process through the fill plug is slow. You can speed it up a little by manually pulling up one or both of the cylinder shafts while filling the pump - this creates a vacuum in the reservoir. We recommend against taking off the reservoir, because you might damage the reservoir or its o-ring in the process. In particular, we recommend against drilling a hole in the reservoir. You will be introducing foreign particles into the system, plus the reservoir gets pressurized when the hydraulic cylinders retract.Possible fluids to use:FeBi 02615 Aral Vitamol Mercedes fluid p/n A 000 989 9103 (10) Pentosin CHF-11S Mopar 05127381AA Univys 26All fluids above will mix with each other or with the original fluid in the pump, and they are safe to use in the system.Owning and driving a convertible with an automatic top is prestigious, convenient and exciting - let Top Hydraulics help you enjoy your beautiful car even more by making your convertible top system truly better than new!